As the global maritime market remains mired in a slump, Lloyd’s Register continues to expand rapidly in the Americas market where it sees green fields of opportunity. 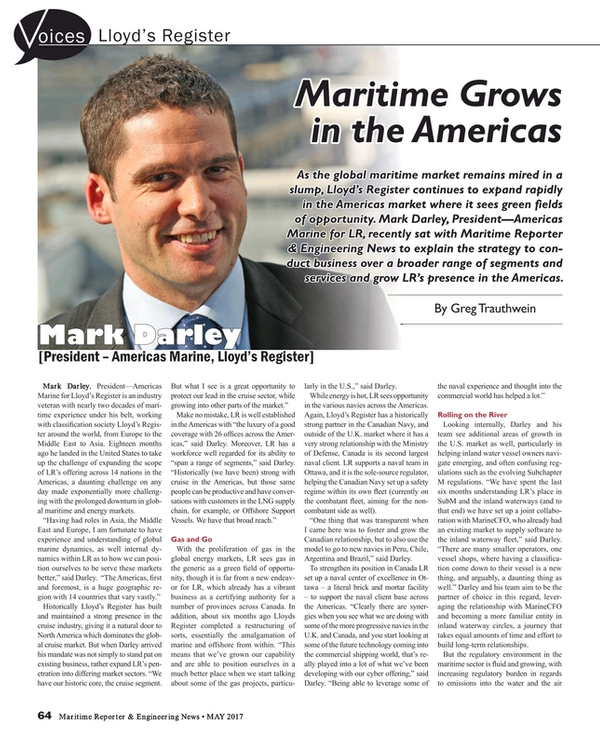 Mark Darley, President—Americas Marine for LR, recently sat with Maritime Reporter & Engineering News to explain the strategy to conduct business over a broader range of segments and services and grow LR’s presence in the Americas. Mark Darley, President—Americas Marine for Lloyd’s Register is an industry veteran with nearly two decades of maritime experience under his belt, working with classification society Lloyd’s Register around the world, from Europe to the Middle East to Asia. Eighteen months ago he landed in the United States to take up the challenge of expanding the scope of LR’s offering across 14 nations in the Americas, a daunting challenge on any day made exponentially more challenging with the prolonged downturn in global maritime and energy markets. With the proliferation of gas in the global energy markets, LR sees gas in the generic as a green field of opportunity, though it is far from a new endeavor for LR, which already has a vibrant business as a certifying authority for a number of provinces across Canada. In addition, about six months ago Lloyds Register completed a restructuring of sorts, essentially the amalgamation of marine and offshore from within. “This means that we’ve grown our capability and are able to position ourselves in a much better place when we start talking about some of the gas projects, particularly in the U.S.,” said Darley. While energy is hot, LR sees opportunity in the various navies across the Americas. Again, Lloyd’s Register has a historically strong partner in the Canadian Navy, and outside of the U.K. market where it has a very strong relationship with the Ministry of Defense, Canada is its second largest naval client. LR supports a naval team in Ottawa, and it is the sole-source regulator, helping the Canadian Navy set up a safety regime within its own fleet (currently on the combatant fleet, aiming for the non-combatant side as well). “One thing that was transparent when I came here was to foster and grow the Canadian relationship, but to also use the model to go to new navies in Peru, Chile, Argentina and Brazil,” said Darley. Looking internally, Darley and his team see additional areas of growth in the U.S. market as well, particularly in helping inland water vessel owners navigate emerging, and often confusing regulations such as the evolving Subchapter M regulations. “We have spent the last six months understanding LR’s place in SubM and the inland waterways (and to that end) we have set up a joint collaboration with MarineCFO, who already had an existing market to supply software to the inland waterway fleet,” said Darley. “There are many smaller operators, one vessel shops, where having a classification come down to their vessel is a new thing, and arguably, a daunting thing as well.” Darley and his team aim to be the partner of choice in this regard, leveraging the relationship with MarineCFO and becoming a more familiar entity in inland waterway circles, a journey that takes equal amounts of time and effort to build long-term relationships. In March LR launched the next stream in its cyber and digitalization suite of services, an end-to-end set of solutions addresses the need to keep people, assets and systems secure within the constantly changing cyber security landscape. The new set of services from LR is built on a model that provides clarity and allows evolution in line with emerging threat patterns and the changing regulatory environment, designed to help clients understand how cyber secure they are now and what level of security they want to achieve in the future. The new offer will deliver cyber security gap analysis and other readiness services to owners, operators and other clients against the US Coast Guard Strategy on cyber security and forthcoming IMO regulations as well as the cyber security best practice already established in other industry sectors, such as Naval. To this end, LR has chosen to work with QinetiQ, bringing the benefits of QinetiQ’s cyber security skills, knowledge and experience, to complement LR’s own expertise in marine and offshore risk management.